1. To start the process, wet your hands and the hair with water. This will give you better control over the hair. Gather the hair and pull it back, applying hair gel if more control is needed. 2. Use hair brush to smooth out rough or uneven areas, forming a ponytail by brushing the hair up from the jaw lineto the upper part of the back of head. This will form a high bun. 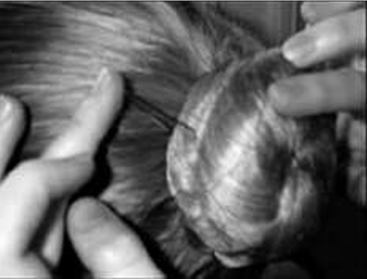 The placement of the ponytail determines the placement of the bun. Mid and low buns are sometimes used for short hair, or for a stylized look. Most common placement is the middle – directly in line with eyes. 3. Use a hair elastic to secure the ponytail. A tidy ponytail with the hair drawn snugly back is the key to making a great ballet bun. 5. Coil the twisted ponytail into a tight circle. 6. Use a few hair pins around the outside of the coil to secure the hair. 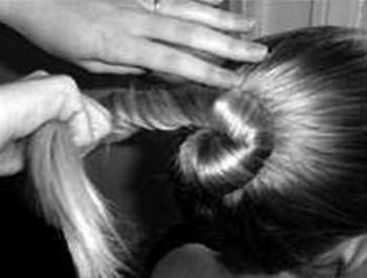 Slide each pin through the outer part of the coil, then into the base of the bun, pointing toward the hair elastic in the center and tuck underneath the elastic. 7. Wrap the hair net around the bun. Keep twisting and layering it so that the net secures the bun. 8. With long or thick hair, you may end up with a bun that protrudes too much. A flatter bun is preferable. 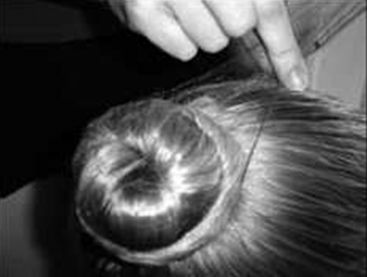 To flatten, remove all pins; the hair net will hold the bun. Then flatten and re-shape the bun, and repin all around the bun. 9. For extra hold, after completing the bun, use hairspray. 10. Pin back all bangs and short hairs using gel/hairspray and bobby pins.